videos, ensure they are compatible, or even compress them by using codecs with better compression rates. But if you want to do any of that you first need a converter that will enable you to convert the format of your video. One of the best options as far as video converters are concerned is definitely Movavi Video Converter. It is a simple and easy-to-use converter that will provide you with several key advantages that allow it to stand out. Essentially Movavi Video Converter simplifies video conversion to make it easy and straightforward. Its approach will ensure that you don’t need to have a technical understanding of video formats or settings, nor will you need to be familiar with the wide range of formats that are out there. In fact if you want to convert a video using Movavi Video Converter it is as easy as adding the video, choosing a format, and clicking the ‘Convert’ button. To simplify it further there are built-in presets for various devices and platforms that you can use as well that will automatically set the video format and settings on your behalf. In short you should be able to convert your videos and optimize them without any issues using Movavi Video Converter. Compress videos by adjusting the bitrate or setting the desired output file size. Convert audio and image files between various formats. Convert across media types to create animated GIFs, extract audio tracks, grab screenshots, and more. Edit videos to enhance their quality, add captions, adjust audio levels, and so on. Resize videos by a percentage, to a specific size, or to fit into a frame using a variety of means. Hardcode subs in videos by using it to add SRT to MP4, MKV or any other format. 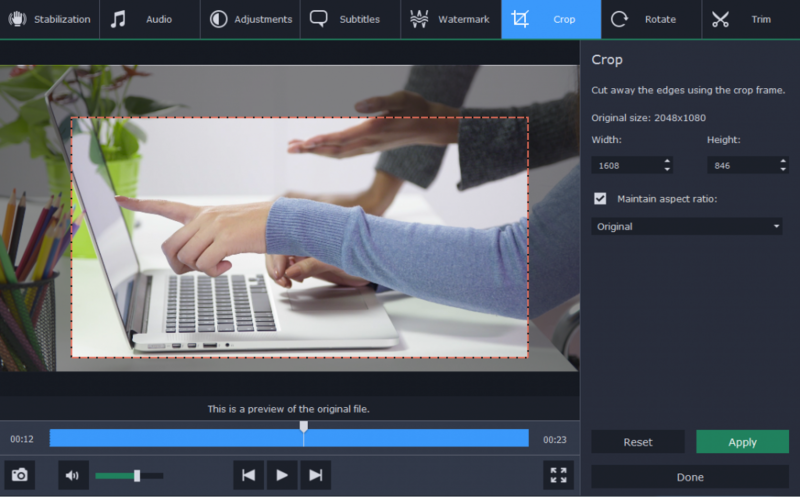 Based on these features you should be able to see that Movavi Video Converter could play a key role in allowing you to prepare videos and alter them in small ways. In fact it would be more accurate to think of it as an all-in-one media converter and utility for handling tasks involving media files. At the end of the day it is up to you to decide which of Movavi Video Converter’s features you would like to use to prepare your videos or media files. That being said it is worth trying them all out initially, just so you get a feel for how they work and what they can do. After you’re more familiar with Movavi Video Converter’s features, applying them to your videos should be easy. In fact it is safe to say that with its capabilities up your sleeve you will be able to do more with your videos than you’ve ever done in the past.